All of our students have now finished their studies and will shortly be receiving their degrees from the University of York. As part of this they all produced a report (or thesis), which acknowledged the support of Charity Soul. Without this support they would not have been able to do the complicated genetics experiments they have reported. All of the experiments seemed to work, and we have prostate cells in which 3 different genes have been edited. Due to the students’ time constraints, the full time scientists in York are now studying these cells to make sure that the editing is exactly where we want it to be. That is, apart from one gene known as TP63 which resulted in cell death when we deleted it. This agreed with some other work we had done a few years ago, but makes it difficult to study. Like a dead parrot there’s not much you can do with dead cells! Now we have to examine the ‘base sequence’ of the remaining 2 genes to find cells with one and two edited copies. This is painstaking work and could take several more months. Once we have these cells then we are on the first steps to finding their role in cancer stem cells. The first experiments with the dead cells were the easy ones. If we edit out the TP63 gene: stem cells die. 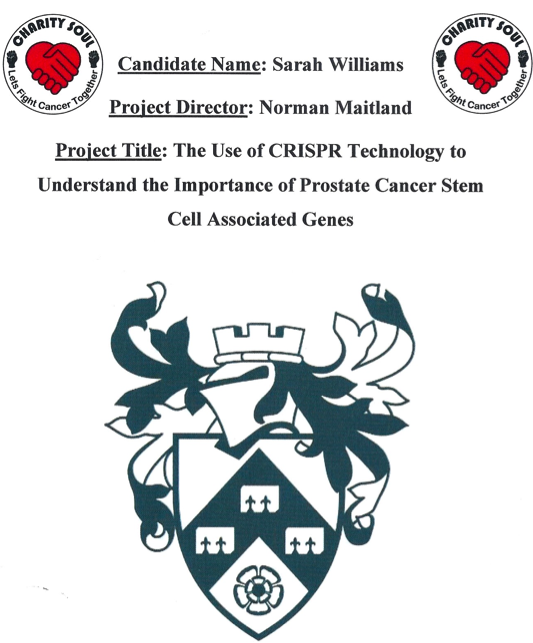 Good science takes time (Giovanna’s paper took almost 5 years to complete) but knowing the key genes which result in prostate (and many other cancers) will allow us to treat them directly, rather than wasting time and effort on the many other genes which change in cancer, but do not cause the tumour. A copy of the front page of the TP63 report is shown below……..